Gun rights groups plan mock mass shooting at Univ. of Texas-Austin. 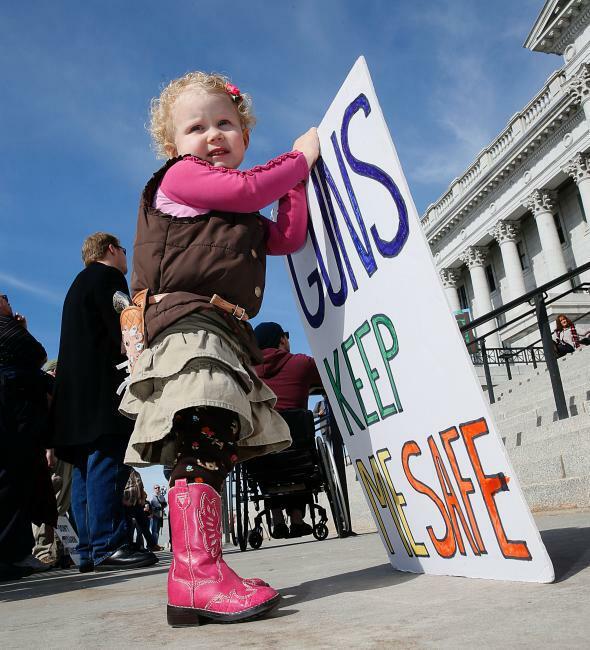 With a toy side arm two year old Arianna Ludlun holds a sign at a gun rights rally and march at the Utah State Capitol on March 2, 2013 in Salt Lake City, Utah. There have been two high-profile mass shootings in the U.S. in the last two weeks alone—in Colorado Springs and San Bernardino. It’s already a tough enough time to read the news each day and then you come across this story intro from the Austin American-Statesman: “Gun rights groups say they will conduct a mock mass shooting this weekend at the University of Texas campus as they try to end gun-free zones.” It’s finals week, after all. Where to begin? The scenario the group wants to act out isn’t as far fetched as you might think, as new state laws will allow students at UT to carry firearms to class or in their dorms beginning in August; those with a concealed handgun permit can already carry on certain parts of campus. As you can imagine, the university wasn’t happy with the idea of a mock shooting (by non-students) as a form of protest and said the groups could face criminal trespassing charges for staging it on campus. Come And Take It Texas founder Murdoch Pizgatti told the Dallas Morning News “we’re not planning on disrupting or panicking people” and that they would hold the mock mass shooting adjacent to campus instead.